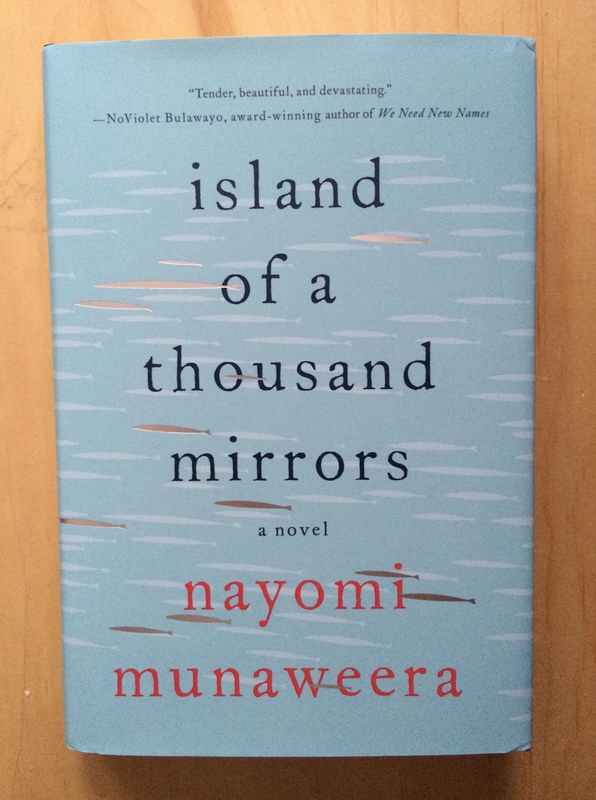 Island of a Thousand Mirrors* is Nayomi Munaweera’s first novel, and despite a few flaws, it is a moving and very promising debut. The novel is largely set in Sri Lanka, and it split in two parts. In Part One, the narrator, Yasohadra, tells the tales of her family history. Both sets of her grandparents had high hopes for their favored children—Yasohadra’s parents—hopes which both were and were not fulfilled. As children, both Nishan and Visaka witness the dangers of being different. One of Nishan’s classmates is assaulted on a train because she’s thought to be Tamil, not Sinhalese; Visaka must hide her first love affair because the boy is Tamil and she is Sinhalese. Visaka and Nishan’s children are Yasohadra and Lanka; their best friend, and upstairs neighbor is Shiva, a Tamil boy. When the civil war begins, tragedy strikes the girls’ family, and it’s only their grandmother’s courage that saves Shiva and his family from death at the hands of an angry mob. It is impossible to tell what they have seen, what they are escaping, They do not ever talk about these things, They seem so foreign to us, they have not yet learned to suppress their smells and moderate their voices. They are surprised by too much and too easily impressed by America. Part Two begins years after Yasohadra’s family has left their native country. In the northern part of Sri Lanka, Saraswathi lives with her parents and sister in a war zone. Her brothers are dead, after volunteering to fight with the Tamil Tigers or, like many children, kidnapped to serve with them. Saraswathi is smart, ambitious, and very afraid. She’s sixteen years old, and the Tigers want her too. Back in the United States, Lanka and Yasohadra are dealing with turbulence in their personal lives. Lanka returns to Sri Lanka to teach children maimed by land mines. Yasohadra decides to join her, and finds that Lanka has reconnected with Shiva, their childhood friend. In the north, Saraswathi is violently assaulted by soldiers from the national (Sinhalese) army, and, ashamed and afraid, her parents hand her over to the Tamil Tigers. Before long, she becomes a soldier, brutal and ruthless, convinced of her cause’s righteousness and envious of the suicide bombers (called Martyrs in the training camp) glorified all around her. As Saraswathi and the sisters draw closer to each other, their end is almost inevitable; Island of a Thousand Mirrors gives us a glimpse of the thousand decisions that draw people together and rip them apart. Ms. Munaweera’s prose, particularly her depictions of the sights, tastes, and smells of Sri Lanka, is assured and often lovely. Her sense for metaphor and detail is also very good: as children, Yasohadra and Lanka, listening to a storyteller, “lurch about the balcony like ocean-tossed fishermen, drunk on the picture he has painted with his words” (72); Saraswathi allows herself to remember only the taste of her family’s well water once she leaves home. Given the strength of the writing in Island of a Thousand Mirrors, I look forward to reading more of Ms. Munaweera’s fiction. However, I do have reservations about the structure of the novel. I think Saraswathi’s late entrance into the narrative is Ms. Munaweera’s way of showing us just how far removed Yasohadra and Lanka are from the desperate situation of the Tamil villagers on the northern part of the island. However, the thumbnail sketch of her family’s history and lifestyle, while skillfully drawn, falls flat when compared to the attention paid to Nishan, Visaka, and even their parents. Saraswathi’s transformation from mild-mannered mathematics student to vicious soldier (she kills children) is crucial to the novel’s plot and message, but that transition is rushed and not fully explicated. Her hatred toward Sinhlalese soldiers, and even the government, is understandable; her willingness to inflict pain and death on noncombatants is not. She needs a fuller portrait. On a similar note, several other secondary characters fade from the narrative without satisfactory explanations, even when their backstories are incredibly interesting, which I found frustrating. With those reservations attached, I recommend Island of Thousand Mirrors for its strong writing and its nuanced portrayals of Sri Lankan families facing traumatic upheaval. I 100% agree with you on this one. I absolutely loved the second half of the novel and so wish that Munaweera had shifted the structure a bit to introduce Saraswathi earlier. I agree. And thanks for the shout-out in your post that included this book! Wow – this sounds like a really great book. I’ll have to give it a try! I think you’d really like it, Ariel. It’s right up your alley. Thanks, Carolyn, this was very helpful. I saw this book a few weeks ago and was curious about it.